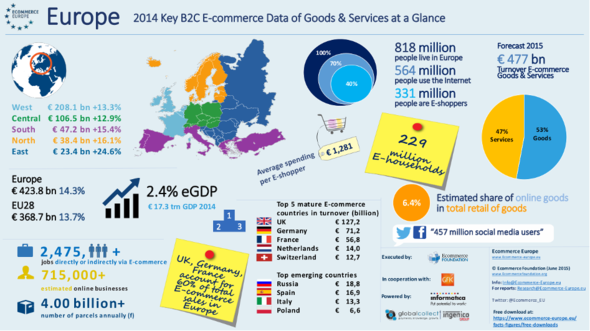 The European B2C e-commerce sector had another successful year in 2014. Even though the growth rate of the e-commerce turnover decreased somewhat, it still achieved double digits. 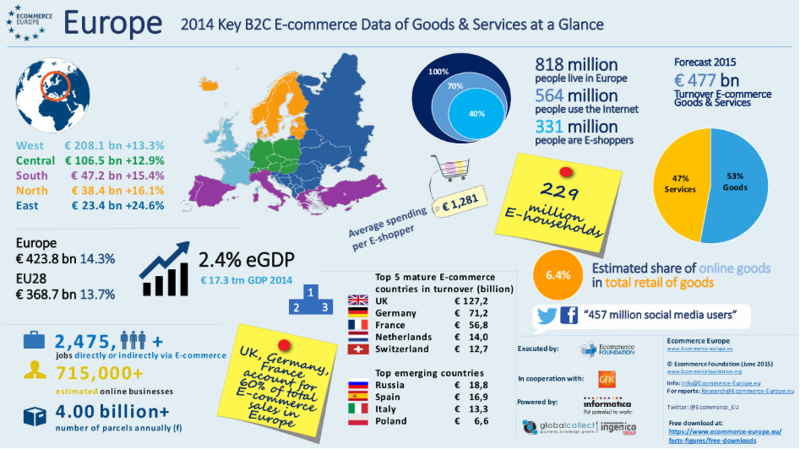 In total, European B2C e-commerce sales increased by more than 14%, reaching € 423.8bn. The 28 member states of the European Union together experienced a similar growth, resulting in a EU28 B2C e-commerce turnover of € 368.7bn. These numbers stem from the new European B2C E-commerce Report 2015, which is the first one in our range of 2015 European reports. The European e-commerce figures are compiled with the help of various national e-commerce associations and in cooperation with GfK. In addition, the report is powered by GlobalCollect | Ingenico. Whereas e-commerce is still booming within Europe, the overall economy is only just getting back on its feet. This is evidenced by the fact the European GDP only increased by 1.6% to € 17.3trn. Within the EU28 this growth rate was even a little lower, at 1.4%. The share of e-commerce within the European GDP continues to grow. Whereas this rate amounted to 1.27% in 2009, the eGDP nearly doubled to 2.45% in 2014. It is expected that this share will grow even more strongly in the next few years, probably reaching a European eGDP of around 6% in 2020. Other indicators of the growing importance of e-commerce in the European economy are the number of B2C websites and the amount of parcels sent in 2014. Both these figures grew considerably compared to the preceding year. Whereas there were around 650,000 B2C websites and 3.7 billion parcels were sent in Europe in 2013, we estimate that these numbers increased to about 715,000 B2C websites and 4.0 billion parcels sent in 2014. Finally, the number of jobs created directly and indirectly by the B2C e-commerce sector is estimated at nearly 2.5 million in Europe. This figure will undoubtedly grow with the on-going increase and penetration of the Internet in the European society, and the projected growth of (B2C) e-commerce. Just like in 2013, the United Kingdom was the most important B2C e-commerce market within Europe in 2014. Its B2C e-commerce turnover increased by 14.7% and reached € 127.1bn. With this growth, the UK increased its lead on its nearest rivals Germany (+12.3%, € 71.2bn) and France (+11.2%, € 56.8bn). Not surprisingly, Western Europe, the region that includes both the UK and France in this report, is by far the largest region in terms of e-commerce sales. Western European B2C e-commerce sales amounted to € 208.1bn last year, representing nearly half of the entire European B2C turnover. Central Europe, in which we find Germany, was the second largest B2C e-commerce region, with a turnover of € 106.5bn and a market share of a little over 25%. In general, the biggest growth in terms of B2C e-commerce sales can be found in Central and Eastern Europe, with Russia leading the way. In 2014 this Eastern European giant accomplished a growth of no less than 25.4%, resulting in a B2C e-commerce turnover of € 18.8bn. Combined with the fact that Russia is already the fourth-ranked e-commerce market within Europe, this growth rate makes it clear that the country is an e-commerce force to be reckoned with.